There is just so much to see, and I promise there will be more. I am going early tomorrow to have a wander before the show opens. I was beyond excited to see Lisa of the Red Thread represented so well. (can't figure out how to link could someone add it in the comments for me). 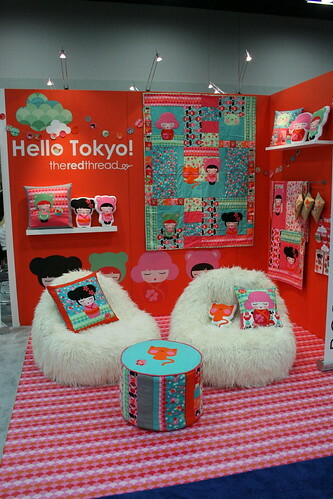 Her Hello Tokyo range looks great ! Lisa and I met at Stitches and Craft many moons ago when we were neighbours. Her work is delightful and she is worth following on any and all forms of social media. Famous Folk 3: Met Bari J last night and had a great chat. She is lovely of course and this morning I saw her sweeping her booth floor. ( See... sweeping her own booth, can't get much more real than that). I wanted to take a sneaky photo but you know I'm too professional . Famous Folk 4 : I was walking along and saw a man and he seemed familiar so I smiled a vague smile and thought "oh he must be a dad from school" ...... dad ? oh that was quiltdad !!!!! So I did a quick about face and walked past again just to be sure. Then I raced back to the booth to tell Jemma who replied "quiltdad hey, so I guess he is some dad who makes quilts?" My daughter is a craft heathen. Weird stuff 2 : The light switches are the opposite to Australia so everytime I leave a room I turn the lights on ! It's quite dementing. I wish I was there with you! It really sounds awesome! 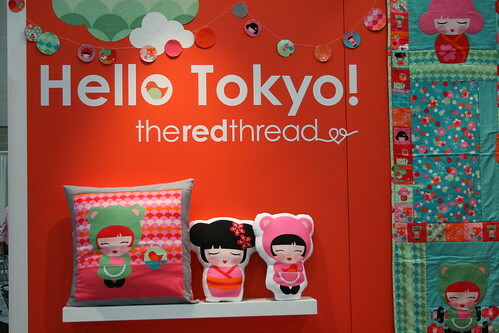 I have made some Red Thread super boys, her stuff is too cute! Pictures of your booth please! Keep having fun! I've only been to foreign once - Germany, it freaked me out that they have square pillows (as in to sleep, not cushions, that's another matter). It must be very strange being a craft heathen in that land. Have you had lots of visitors? I would go nuts (well more so) with those light switches. Our house has two way switches and I had hubby alter them two weeks after we moved in, so that when they were off, both looked off, as opposed to how they had been, where one always looked on and one off. I couldn't stand it. 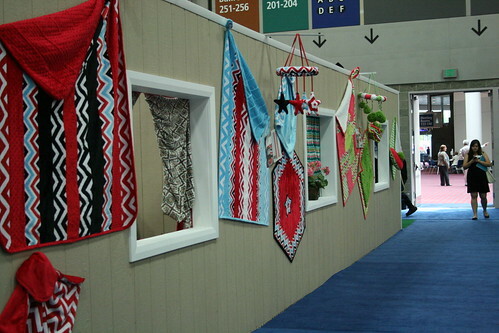 No, I would be at the local loon bin, not at Quilt Market if I were there. Enjoy. Oh man! You should hv gone and mugged John when you went back past. He can take it. Has Laura Jane found you yet? Jodie - be honest you forgot your camera so couldn't take a photo of Bari J!!! After all if you had a camera you would have taken lots more photos and shared them here for all of us still stuck in the wrong hemisphere wishing they were sweeping out your booth!!! LOL... You are a hoot, Jodie and I'm loving your QM posts. To tell the truth, I really wanted to be there this year (for the first time), mostly so I could meet you and Nikki (Portland is a lot closer for me than Australia). I think of you as Famous Folk! Jodie, I was talking to Lisa last night at a bloggy thing, and she told me her fabric line was premiering at Quiltmarket yesterday, and we talked about how you were there too!! So nice to see photos, you must have heard us :-) thanks! You would make my famous people list Jodie!